Form and Foliage went to the opening of the 2013 San Francisco Flower and Garden Show today and we were greeted by a display garden that was a lovely execution of the F&F principles: lots of structural plants that relied on foliage for interest, good range of colors, shapes and textures and, even in the mass plantings, enough spacing to let the shapes show. 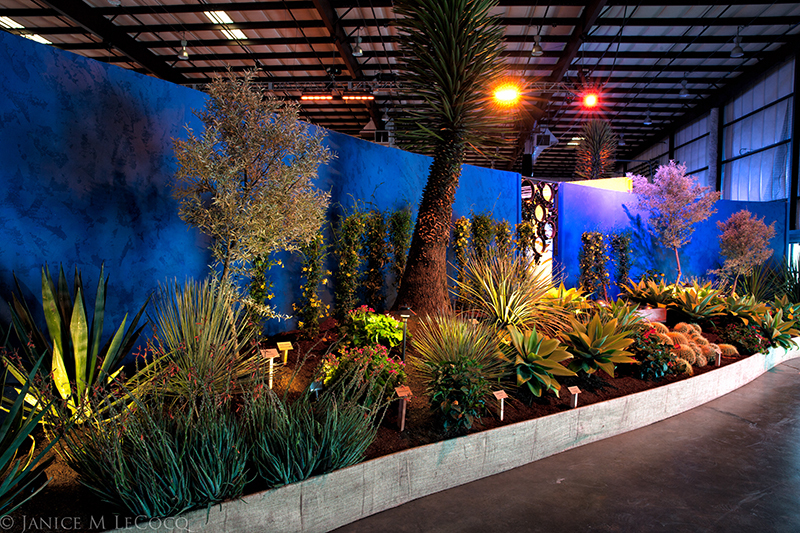 The garden was titled ‘Inside Out’ and used inspiration from urban Mexican culture and architects such as Ricardo Legorreta & Luis Barragan. Designed by the School of Architecture and Landscape Architecture at Arizona State University, this garden was evidently appreciated by many others, as it was the winner of numerous awards. The garden used several Agave cultivars, including the relatively newly introduced ‘Kara’s Stripes’, which has broad softly striped leaves that form a graceful rosette, and which lack that lethal terminal spine. 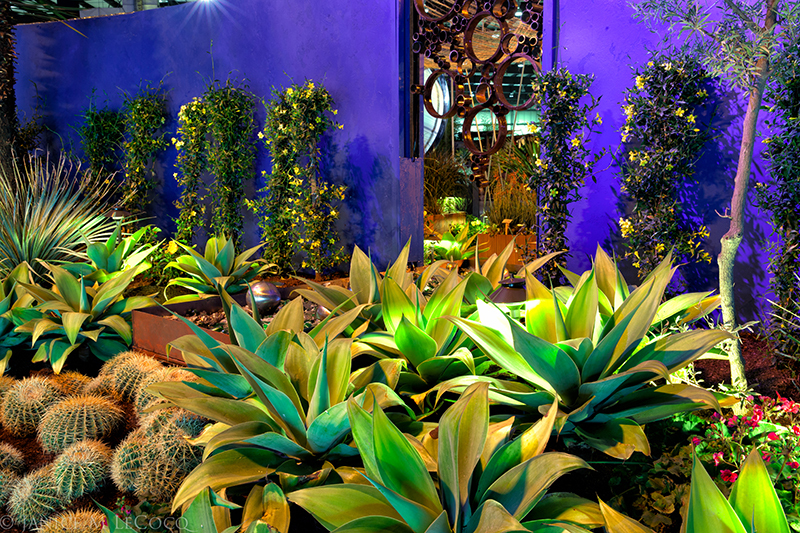 The lighting was designed to let shadows play on the boldly colored walls, bringing movement and drama to the garden. The row of Fouqueria splendens (ocotillo; desert coral) on the right forms a living fence, attractive even with bare branches. 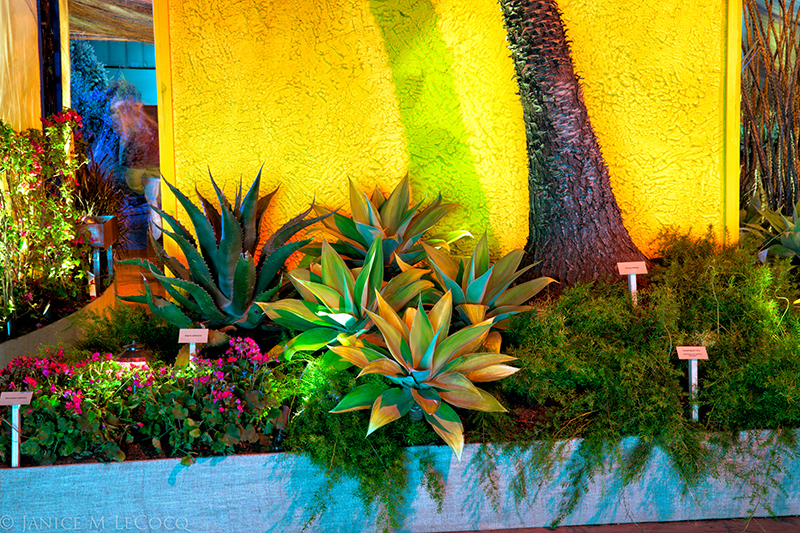 The garden captured the spirit of Mexico with its vibrant colors, which worked well with the strong lines of the plantings. There were some flowering plants, but in F&F style, they were not expected to carry the garden or the mood, but rather act as accents that could easily be changed seasonally. We liked the designers’ use of pedestrian materials such as concrete blocks and repurposed metal piping. The aluminum caps on the walls in the above photo were a nice touch and an example of the attention to detail in this garden. 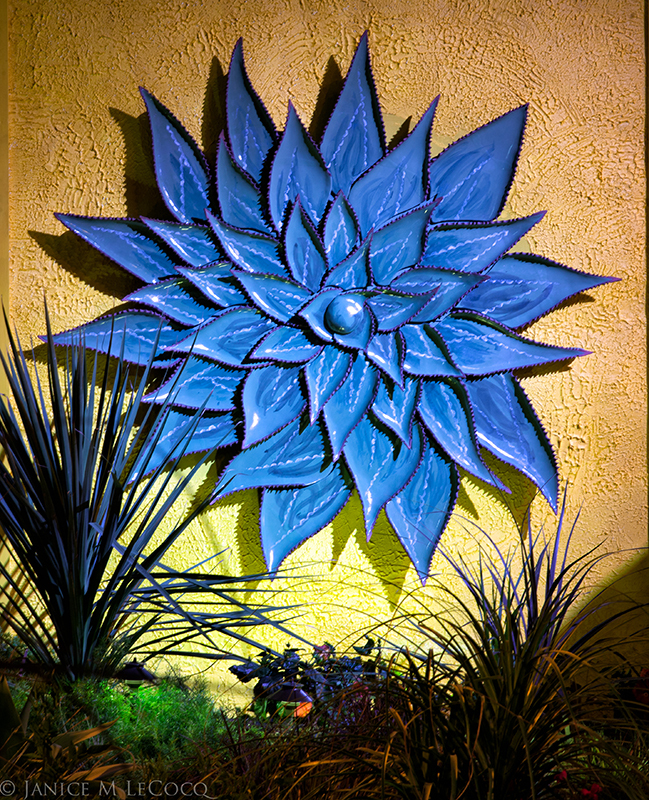 The garden art echoed the plantings perfectly! Finally, we loved the fact that this garden took the F&F theme into the art! This playful representation of an Agave is also evocative of the sun, and it shone cheekily over the seating area. 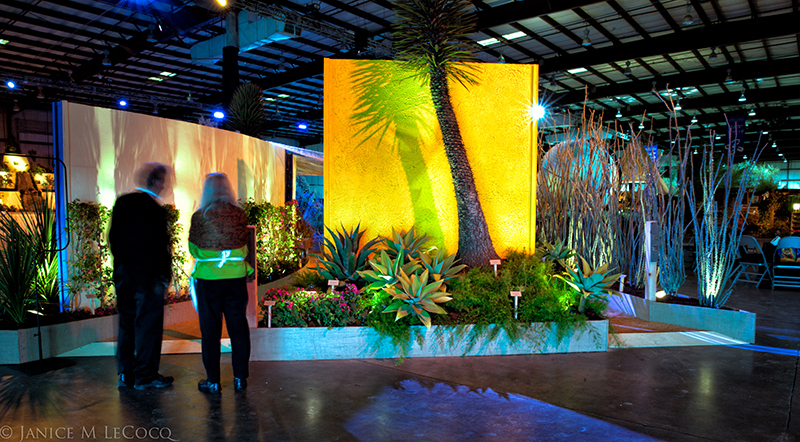 The SF Flower and Garden Show runs through March 24th and there is an extensive trade fair as well as seminars, demos, etc. Just make sure that you include a trip to ‘Mexico’ so that you can see this wonderful garden for yourself. 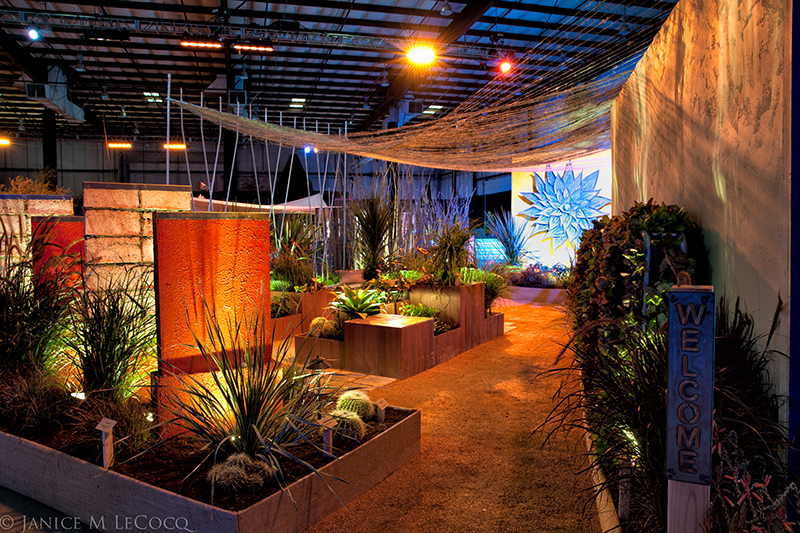 Categories: Design philosophy, Mexico, SF Flower and Garden Show | Tags: 2013 SF Flower and Garden Show, color, garden art, garden design, garden photography | Permalink. Sara: A Great review and writeup…..nice photos also…. Roger G.
Wow Sara……..Nice Post Girl! 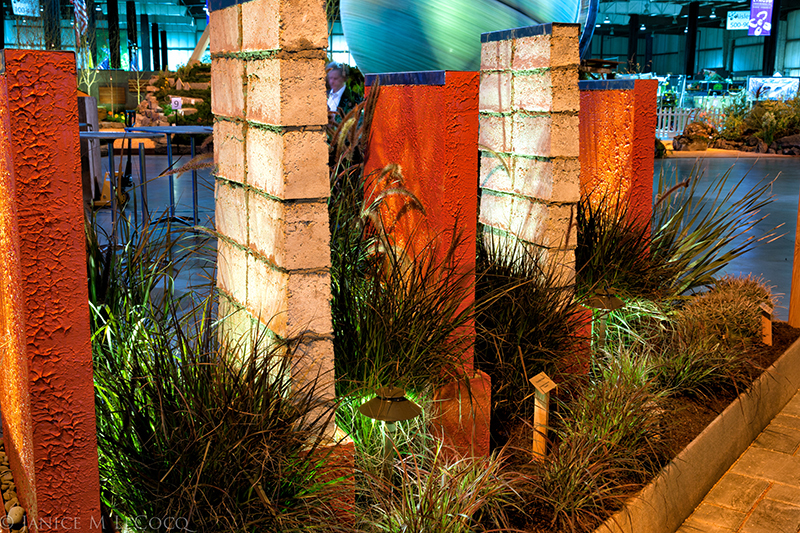 The garden show is always a great opportunity to see whats new and inventive. The displays are awesome and so design conceptive. A great open pallet like that is gardening that came from some plant not know to man, Really! Nice photo’s as always, such colors and set design with lighting to die for that adds depth and color contrast. Love the Mexican theme! Whoa! The colors and lighting are fabulous! Do they really garden like that Down Mexico Way?